Reggae music has seen a proliferation of compilation albums in recent years, often featuring numerous artists singing over only on or two riddims. Greensleeves' Rhythm Album series is one such example, having released more than 16 such albums in the span of less than one year. More times than not, these compilations fall flat with their unremarkable computerized rhythms or artists whose conventional chants and lyrics render one song indistinguishable from the next. A big exception to this trend is the newest release from Strong Foundation records, "Jah Love". This album features a dozen roots artists skillfully singing and toasting over several well-rounded and meticulously crafted drum and bass selections. After listening to just a couple of bars from the opening track, listeners will immediately know that the producers invested a great deal of time and energy, giving the album its wonderful vibe. The album contains selections by well know conscious roots performers such as Yami Bolo, Sugar Minott, Norris Man, Rocker-T and Daweh Congo, along with selections by newer artists like Fiji, Ipa and Natty Bi. Each of the singers appearing on this album obviously labored to distinguish their song and to capture a genuine feel for that artist. 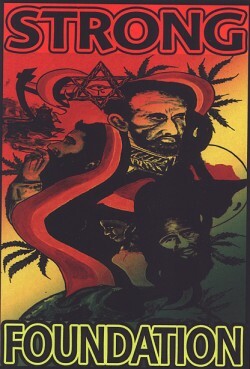 My favorite selections are Yami Bolo's "Jah Love Is Always There", Daweh Congo's "Jah Name", and Rocker-T's "Fiyah Dem", followed closely by the Norris Man and Ras Shiloh songs. In fact, every selection on this album has caught my attention at some point or other, which is why Jah Love is the very first compilation album ever to reach the number one position on Ireggae's Top Ten. Big up to Strong Foundation for this crucial release, and for making it available on vinyl as a double album for the DJ massive.